The whole month of September is full of various celebrations, that are awaited by the nation. One of the occasions is Independence Day on September 21, that celebrates the anniversary of gaining independence from Great Britain in 1981. 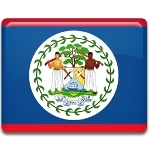 Belize became a British colony in 1836, when Britain claimed the right to administer the region after the emancipation of Central America from Spanish rule. In 1862 Britain formally declared Belize to become its crown colony and named it British Honduras. The colonial economy of British Honduras nearly collapsed during the Great Depression of the 1930s and the effect of unemployment was worsened by a devastating hurricane in 1931. During World War II economical situation in British Honduras improved, but after the end of the war it stagnated again. When Britain devalued the British Honduras dollar in 1949, the worsening economic situation led to creation of the People's Committee, that demanded independence from Britain. Various constitutional reforms were initiated in 1954 and British Honduras was granted self-governmental rule in 1964. In 1973 the colony was officially renamed into Belize and on September 21, 1981 Belize officially became an independent country. Celebration of Independence Day features famous Uniform Parade and Carnival. The whole month is dedicated to various activities, that mark Independence Day and National Day on September 10.